Celebrating your child’s graduation from preschool is a significant developmental milestone. Remember dropping off your tiny tot at preschool and they cried while you’re blinking back tears? It’s time to celebrate their success by gifting them with our miniature medallion! 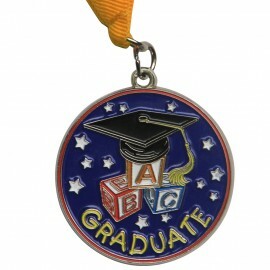 Gradshop’s silver medal has detailed colored plating and a durable gold neck ribbon and it is a perfect way to recognize your little scholar’s achievement from preschool.